Today was an out-an-out show massacre at ABC, where everything from decent newer shows (Agent Carter) to longstanding veterans (Nashville) got the ax. About the only person at ABC who emerged unscathed was Shonda Rhimes. She grabbed a second season for her new The Catch, along with a new show, a period piece about the Montagues and Capulets post-Romeo And Juliet that no one was looking for. This all despite a year wherein some of her shows are doing well—Grey’s Anatomy, in its 12th year, is still a ratings champion—and some, like this one, is not. In a year in which Scandal appears to have lost its way, the once-promising show becomes too tough to watch. It wasn’t always this way. 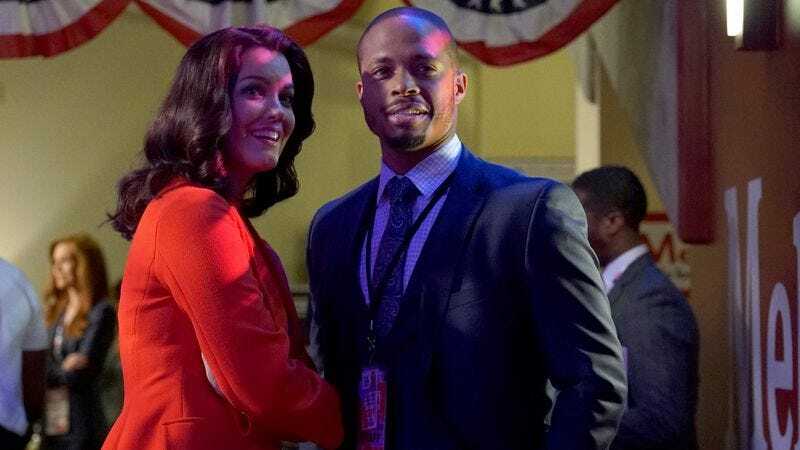 The first time I wrote about Scandal, subbing for the regular reviewer, I made the rookie mistake of describing what happened too much, as the show was so plot-thick I felt like I had to mention it all to keep track. Last year’s finale, although heinous, was startling enough to keep the viewer from turning the channel, even if under the surface they really wanted to. This one is outright bland in comparison. After all, does it really matter if Eli is pulling the strings behind Olivia or not? After so many years of the Pope family, we got to see how much Olivia’s father (with helpful flashbacks provided here) helped steer her involvement overall. He always is controlling her actions, even when he doesn’t appear to be, by the way that he raised her. So while this moment is likely intended to be gasp-worthy, it really isn’t. Worse, it diminishes our Olivia from powerhouse to puppet. In which case, she and her “brother” Jake deserve each other. Olivia, Eli, and Cyrus all want the same thing: the power that comes with the Oval. Poor Jake, (I know, I said “poor Jake”), about to be in quite a position of authority, just wants to get back to the sun, and take Olivia with him. But Olivia, so conditioned by her father, refuses to settle for the less-extraordinary life, even as Jake tries and fails to argue that that’s where all the true power is. Ironically, this episode puts Olivia and Fitz farther apart than ever before: All he wants is to get the hell away from the White House, as Olivia desperately tries to scramble back to it. He may be dreaming about Vermont again, but he’ll be going there alone. Olivia, clearly, has sacrificed her whole life to get to that position of power, and all she desires is to get there again. Same goes for Cyrus. I nearly thought that he had finally realized that all he cares about is power, and so was willing to let Michael just get away with running away and taking Ella. Tom’s offers to kill Michael and make it look like an accident I suppose were meant to be sweet (“I’ve seen Of Mice And Men, I know how this turns out”), but instead just pointed to how perfect Cyrus and Tom are for each other, since they’re both monsters. Yet, there was almost a little bit of the old Cyrus that you couldn’t help but cheer for as he stepped onto the platform to run for VP, finally emerging into the spotlight after so many years of hanging back in the wings. 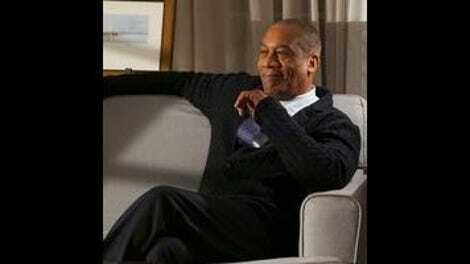 Given the amount of regular Scandal cast members on the other ticket, I don’t have much hope that he’ll win, however. And I think we were also supposed to be blown away by Cyrus’ nomination, but instead, it just made perfect sense. So the big question that remains is whose side Jake is really on. There was no reason for even a puppet like Edison to make a case for Jake with Olivia, but Jake at least knew that casting Olivia as the hero was the way to go. And yet, he started the episode by watching his father-in-law die without even blinking. Olivia, now a killer herself, tries to make the case to Cyrus that killing innocent people is much worse than killing guilty ones, but it’s still, you know, killing people. And would Eli really let Jake walk away? Or are both Olivia and Jake just playing right into his hands again? The problem is that Eli has been so duplicitous since day one, it’s hard to care anymore. At least, it doesn’t make much of a cliffhanger to hang a season on. Thanks so much for reading through this season of Scandal reviews. It started out pretty promising, then took a horrific turn after the winter break. I’ve been thinking about this so much lately: What kind of obligation do the showrunners owe us? The answer is really, none: Shonda Rhimes proved today that she gets the big bucks for a reason, with a major network wiling to keep investing in her when it will invest in almost no one else. Would you call up Hemingway and demand, “Hey, I think the old man should have been able to keep the big fish?” Well, you might have, if there were comments sections in Hemingway’s day, but there weren’t. Today with so many fan forums and comments sections and the longevity of certain shows, people get awfully invested in these fictional characters. I’ve seen debates in the channels below that go on for so long, I’m convinced that people absolutely believe Olivia and Fitz are real people. That means Rhimes is doing her job, and doing it well. But when the characters we root for take a different turn—when Olivia beats a man to death with a chair—we don’t have to read all the way to the last page. The showrunner has the right to tell whatever story they like, and we have the right to watch or not. As I’ve said, I won’t be watching Scandal any more after this season (don’t worry, another TV Club writer will take over these reviews). Now, in the “peak TV” age, where the stakes are higher than ever, there’s just too much good stuff out there to waste time on something I find so frustrating. That is not enjoyable to watch but instead, as so many times this season, just made me want to shower. That has characters I used to like do horrific things, leaving me with no one to root for. It’s hard to pinpoint exactly when and why Scandal lost its way, but lose it it did. Even a quick look at Rhimes’ similar The Catch highlights what she does so well: a sizzling romance between the leads, compelling cases of the week that often lead us where we don’t expect to go. Scandal used to have that. It doesn’t anymore.